These superior quality, calendered polymeric vinyl films have been specially developed for use in the automotive and other industries for blackout, kick tread and stone guard applications. They allow designers to reduce additional painting processes, apply film to areas that are vulnerable to stone chipping or scratching and use film to create unique product and model variations. In particular, they can be used for A/B/C Pillars, Window Profiles, Wheel Arches and General Decoration. Automotive users include Ford, GM, Volkswagen, Toyota and Nissan. 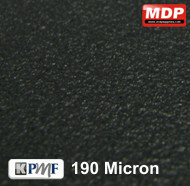 190 micron textured functional film with a clear permanent cross-linking acrylic adhesive. Product is 1220mm wide. 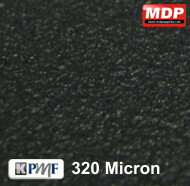 320 micron textured functional film with a clear permanent cross-linking acrylic adhesive. Product is 1220mm wide.